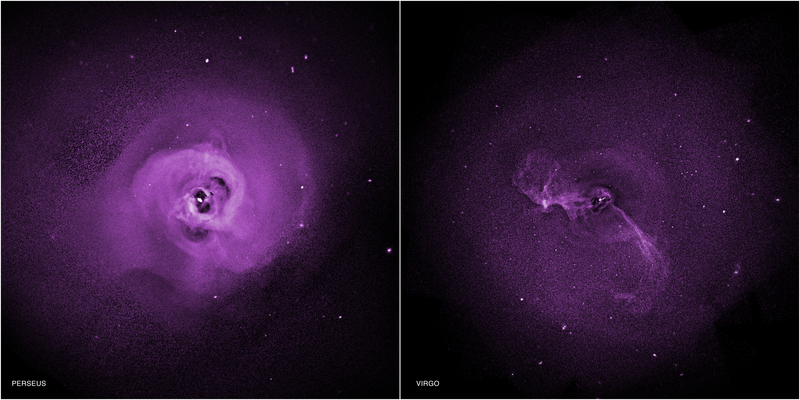 Chandra observations of two galaxy clusters suggest turbulence may be preventing hot gas there from cooling. This addresses a long-standing question of why the vast amounts of hot gas in clusters do not cool to form large numbers of stars. 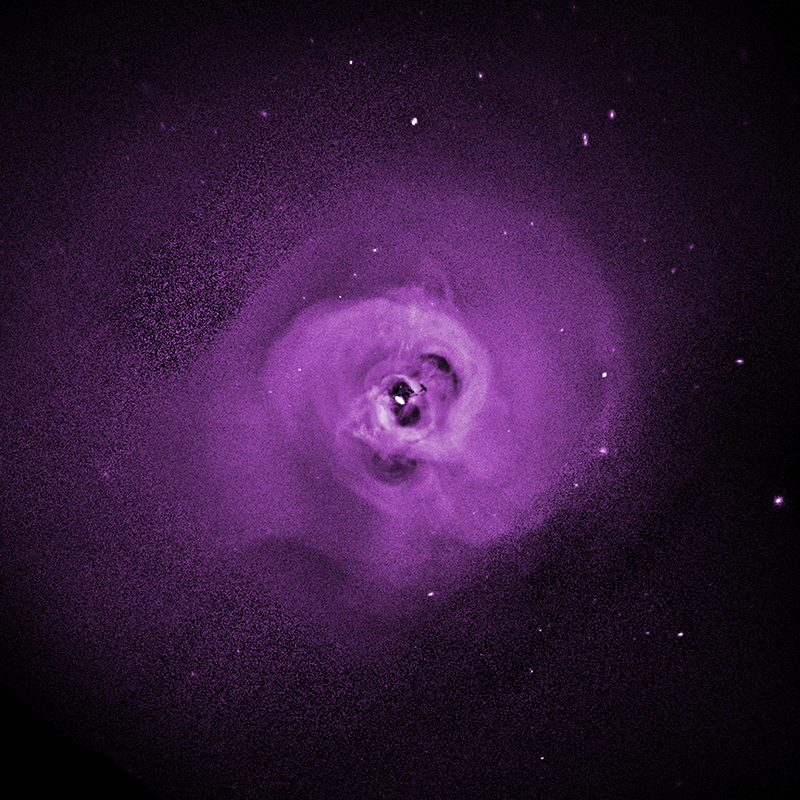 Previous work showed supermassive black holes at the centers of the clusters play a key role in this process. The new finding about turbulence helps fill a gap in the understanding of these giant clusters of galaxies. These two Chandra images of galaxy clusters - known as Perseus and Virgo - have provided direct evidence that turbulence is helping to prevent stars from forming. These new results could answer a long-standing question about how these galaxy clusters keep their enormous reservoirs of hot gas from cooling down to form stars, as discussed in our latest press release. Galaxy clusters are the largest objects in the Universe held together by gravity. They contain hundreds or thousands of individual galaxies that are immersed in gas with temperatures of millions of degrees. This hot gas, which is the heftiest component of the galaxy clusters aside from dark matter, glows brightly in X-ray light. Over time in the centers of clusters, this gas should cool enough so that stars form at prodigious rates. This, however, is not what astronomers have observed in many galaxy clusters. A team of researchers have found evidence that the heat is generated by turbulent motions, which they identified from signatures in the Chandra data. Previously, other scientists have shown the key role of supermassive black holes in the centers of large galaxies in the middle of galaxy clusters. These black holes pump vast quantities of energy into the volumes around them through powerful jets of energetic particles. Chandra and other X-ray telescopes have detected giant cavities created in the hot cluster gas by the jets. The latest research provides insight into just how energy can be transferred from the cavities to the surrounding gas. The interaction of the cavities with the gas may be generating turbulence, or chaotic motion similar to that on a bumpy airplane ride, which then dissipates to keep the gas hot for billions of years. The scientists targeted Perseus and Virgo because they are both extremely large and relatively bright, thus providing an opportunity to see details that would be very difficult to detect in other clusters. The evidence for turbulence can be seen most clearly in the ripple-like structures in the Chandra image of Perseus. When combined with careful analysis of the data with theoretical models, this new result provides the clearest evidence to date that turbulence is the mechanism that prevents the hot gas in these clusters from cooling. The paper describing these results is available online. These results appeared online in the journal Nature on October 26, 2014. The authors were Irina Zhuravleva (Stanford University), Eugene Churazov (Max Planck Institute for Astrophysics), Alexander Schekochinhin (University of Oxford), Steve Allen (Stanford), Patricia Arevalo (Pontificia Universidad Catolica de Chile), Andy Fabian (University of Cambridge), William Forman (Harvard-Smithsonian Center for Astrophysics), Jeremy Sanders (Max Planck Institute for Extraterrestrial Physics), Aurora Simionescu (JAXA), Rasheed Sunayev (Max Planck Institute for Astrophysics), Alexey Vikhlinin (Harvard-Smithsonian Center for Astrophysics), and Norbert Werner (Stanford). Scale Image is 20 arcmin across (about 1.5 million light years). Coordinates (J2000) RA 03h 19m 47.60s | Dec +41° 30´ 37.00"
Scale Image is 22 arcmin across (about 320,000 light years). Coordinates (J2000) RA 12h 30m 49.40s | Dec +12° 23´ 28.00"
NO giant BHs. but Reversed Black Hole hierarchy observed in central Virgo and Perseus full in line with galaxy M104. I am pleased to increase my knowledge about the Perseus and Virgo.